BBYO teens participate in J-Serve, a day of community service. CTeen played a game of laser tag as part of a year-end party. Attending the Bureau of Jewish Education’s I HEART Israel Conference in April are, from left, David Kasper, Sarah Costa, Liz Brough, Ezra Phillips and Nathan Chmelnick. Youth from Temple Beth Sholom of the East Valley enjoyed some mid-Passover bowling. The third season of the Jewish Youth Group Sports League ended with TCTY taking home the coveted League Championship trophy in basketball. In an effort to build a Jewish teen community across the Valley, Jewish News and The League present Teen Scene, featuring monthly content devoted to teen programming. Here is a recap of recent events and a roundup of events to come. Two hundred teens in the BBYO Mountain Region participated in J-Serve, an international day of community service. 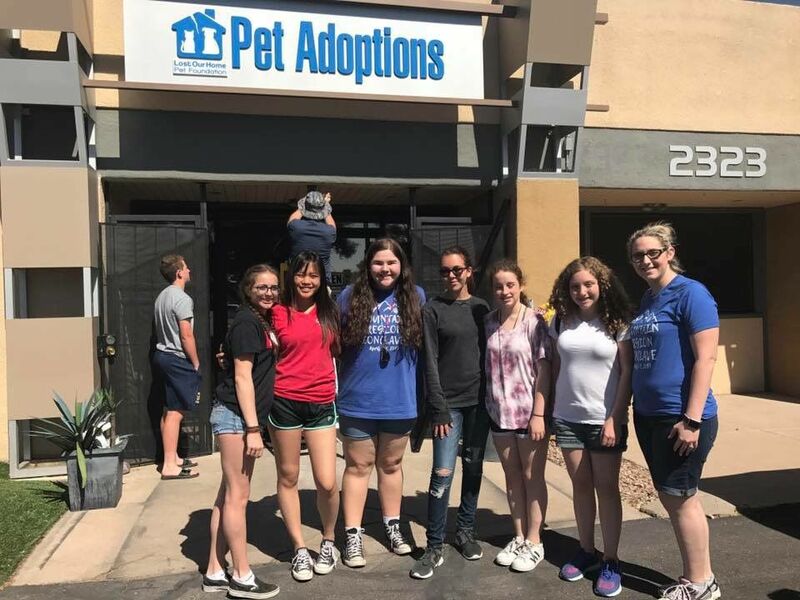 The Scottsdale and Tempe J-Serve project, “Mountain Gives Back,” was hosted by Lost Our Home Animal Shelter, Tranquility Trail and Miracle League. During the project, participants fed and bathed bunnies, helped with the rehabilitation of animals, and played baseball with disabled youth. The girls at Kiviat BBG threw a “retirement” party for Stacey Cohen, who is leaving her post as an adviser of Mountain Region BBYO. She was an adviser for four years, with a total of seven years in BBYO. Since BBYO is a year-round organization, events still happen over the summer. However, since it is summer, BBYO chapters become more flexible with meetings. Each chapter will be meeting at least once per month. To ensure constant communication, teens should be in contact with their chapter boards. B’nai Tzedek teens participated in Good Deeds Day by cleaning and sanitizing mattresses at St. Vincent de Paul on April 23. For information about the Jewish Community Foundation’s B’nai Tzedek Youth Philanthropy Program, contact Andrea Cohen, Acohen@jcfphoenix.org. Recent events include the “Escape from Egypt!” a Passover-themed escape room event, a cookie bake and sale to raise funds for the CTeen Jr club, an end-of-year trip for laser tag and ice cream, and a Lag B’Omer celebration with a bonfire and s’mores. Future events include an Israel-themed Shabbat meal, 7:45-9:45 p.m. Friday, May 19, at a private home, and an ice cream party for all teens at 5:30 p.m. Wednesday, May 31. There will also be an end-of-the-year party on June 11. For details about any of the above, text or call (347)241-7089 or email rabbi.t@chabadcenter.com. The Friendship Circle pairs teens with children with special needs for shared social experiences and is looking for high school students to volunteer as counselors at the Friendship Circle Summer Camp, June 4-9 at the Valley of the Sun Jewish Community Center in Scottsdale. The camp allows children with special needs the opportunity to have a full action-packed camp experience with constant one-on-one attention from teen volunteers. Contact Leah, leah@fcaz.org or visit fcaz.org. Registration for fall classes at the Bureau of Jewish Education’s Hebrew High of Greater Phoenix is now open. Hebrew High provides Jewish teens an opportunity to stay connected with Jewish teens from different high schools across the Valley, to learn from a variety of Jewish educators who provide guidance and answers to questions teens are searching for, and resources for teens to learn about opportunities available to them while in high school and beyond. Hebrew High programs include volunteer opportunities, scholarships for Israel, a Holocaust essay contest and more. Classes meet at three locations across the Valley: Scottsdale, Chandler and Glendale. Hebrew for high school language credit is available in Scottsdale and Chandler. Visit bjephoenix.org to learn more or call Myra Shindler, 480-634-8050. Jewish Student Union (JSU) offers programs at Valley high schools. Email shmuli@dojsu.org. The third season of the Valley of the Sun’s Jewish Youth Group Sports League has come to an end with TCTY (the Temple Chai chapter of NFTY) taking home the coveted League Championship trophy in basketball. It was a hard-fought win over defending champions, Salk-BBYO. The League brings together local Jewish high school youth groups like NFTY, NCSY, BBYO and USY to play basketball and other activities. For more information on joining a youth group or about the League, contact Alexa Wollach at AlexaW@vosjcc.org. Team Phoenix will head to the 2017 Birmingham JCC Maccabi Games, which take place July 30-Aug 4. The Games are an Olympic-style event that is the largest annual Jewish teen event in the country. Sports include boys & girls basketball, golf, tennis, table tennis, swimming, dance, soccer, star reporter and track & field. Contact Alexa Wollach, alexaw@vosjcc.org or 480-483-7121.